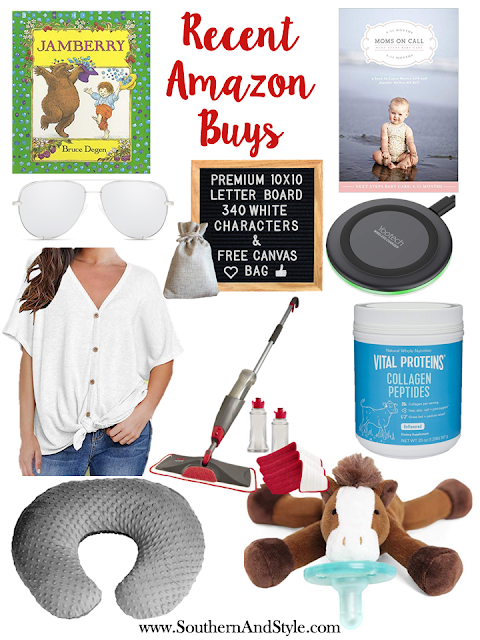 Before having Charlie, I occasionally used Amazon to shop for things that weren't easy to find in store or that happened to be cheaper online (I've always been a big fan of purchasing books on Amazon!) But after becoming a Mama, I find myself turning to Amazon for all sorts of purchases! As you can tell from just these ten items, my purchases are a random assortment of a little bit of everything. The convenience factor is just huge for me and I know it is for so many of y'all as well. These are ten of my purchases from the past six months that I wanted to share. . . This book was a favorite of mine growing up (that probably had to do with the page that shows an illustration and words of "strawberry ponies") and I just knew I needed to snag it for Charlie too! This is a sturdy board book which should hold up well for years to come. I love the sing-songy tone of this book and the beautiful pictures! If you've been reading my monthly updates about Charlie, you'll know that between 3-4 months, I decided I needed help getting his sleep on track and a lot of people recommend Mom's On Call. I found a sample schedule and dove in...it's made a world of difference! So much so, that I finally bought the book for the other schedules. It's helped get him (and myself) in a good routine and I'm thankful for it. It also includes tons of other advice that is helpful for a first time mom like myself. I guess I'm cheating because I didn't purchase this myself, but this letter board was a gift purchased from Amazon and I use it allllll the time. I change it up for holidays and even use it to take Charlie's monthly update pictures. I recently upgraded my iPhone to the iPhone XS and the Verizon store tried to sell me a wireless charger for like $50. I knew that I didn't necessarily have to have one, so I skipped it in store. The more I thought about it, the more I liked the idea-so I grabbed one off of Amazon (for less than $15!) and it's worked great. It comes in different colors as well and makes charging my phone even easier. This top was my first foray into shopping for clothing off of Amazon. I always thought the things that were too pricey could be found cheaper in store and the things that were inexpensive were probably terrible quality. This top is under $20 and now I have four in my closet because they are that good. There are different retailers (I purchased a similar top from a different retailer and the quality wasn't near as good) but this is the best one I have found. The price is right and these tops are so cute! *Note: I also tried the long sleeve version of this top by the same retailer and didn't like the look so it was returned, just noting that for y'all. I fell into the black hole of watching cleaning YouTube videos one day and Jen from How Jen Does It was using this mop and I fell in love. I have to have different pads and cleaners for our wood and tile floors anyway, so this mop was perfect. It came with the mop, three washable pads, and two interchangeable bottles. I use the Method wood cleaner for the hardwood in our home and the Method tile cleaner for our tile and the bottles just pop in and out easily. The pads have washed really well too! I have tried a few different brands of collagen since I started taking it (while I was pregnant with Charlie), but when I discovered this powder (it's also available at Target) I settled on it. There is no flavor, it dissolves completely into my morning coffee, and most importantly-it works. My hair has been falling out (thanks postpartum hair loss) but it's growing back quickly and my nails look great too. When I was shopping for my baby registry, I couldn't find a decent neutral Boppy cover anywhere! So, I registered for the plain Boppy and picked this one up on Amazon for less than $20. Chris and I get asked about these pacifiers almost every single time we go out with Charlie. Charlie only likes the Soothie pacifiers and so unless he is in his crib, if he wants a paci then he's got a Wubbanub. He has the horse, a cow, and a chicken and they are all SO cute. Well, that's the latest from my Amazon hauls & don't forget-you can always keep up with what I'm purchasing from Amazon by looking through my Amazon shop here! What have you purchased from Amazon lately?! Isn't Amazon the best? I love those Quay sunnies, babe- so cute!